In a press conference today outlining plans to restart the water system serving 300,000 people, West Virginia state officials and executives from the West Virginia American Water utility company stressed that levels of the toxic chemical that contaminated the supply after last week’s spill had reached a “safe” level of one part per million (1 ppm), the threshold agreed upon by state and federal officials on Saturday. Unfortunately, the science behind this standard remains unclear. Based on what we do know, there are good reasons to believe that officials are overlooking significant health risks. We know, for example, that the manufacturer’s Material Safety Data Sheet (MSDS) that officials say they are using as their primary source lacks any information about chronic health impacts. The major federal databases we consulted suggest such data simply do not exist for this chemical. It also appears that officials made significant leaps in their calculation of a “safe” exposure level – including assumptions that deviate from generally accepted practices. As a result, these estimates fail to adequately account for either acute or chronic health effects from ongoing exposure to water contaminated at the 1 ppm level. At a bare minimum, the public deserves to know a lot more about the calculations behind officials’ insistence that a 1 ppm level in drinking water is safe. So how was this level, which is now being declared safe, derived? The short answer is, it was done through a mix of standard practice, problematic deviations from standard practice, and utter hand-waving. I blogged earlier about how few health data are available on this chemical (4-methylcyclohexane methanol, or MCHM; its unique identifying “CAS number” is 34885-03-5). With respect to oral toxicity, there appears to be only a single study, conducted in 1990 by the chemical’s producer, Eastman Chemical Company, but never made public. That study uses one of the crudest methods around for assessing how toxic a chemical is: Feed rats the chemical and determine the dose at which 50 percent of the rats die in a short period of time, typically 24 hours. This dose is called the median lethal dose, or LD50. Using that crude test, Eastman apparently found the LD50 for this chemical was 825 milligrams per kilogram of body weight (this value is reported in Eastman’s Material Safety Data Sheet (MSDS) for what it calls “crude MCHM”). Note that a “milligram per kilogram” is equivalent to a part per million, or ppm. [NOTE ADDED 1/15/14: Please note that the description above is not of my own calculations. It is based on press reports citing state and federal officials’ account of the calculations used. As described, the above calculations suggest that an overall uncertainty factor of 825 was applied: 10 x 10 x 8.25. No official description has been released of the methodology used to derive the 1 ppm level. Since posting this, I have discussed the matter further with a toxicologist familiar with similar situations, who notes a disconnect in the calculations between starting with a dose in the exposed animal (expressed in milligrams per kilogram of body weight) and ending up with a concentration in drinking water (expressed in milligrams per liter, equivalent to parts per million). The toxicologist speculates that a somewhat higher uncertainty factor may have been applied but notes many additional variables that may or may not have been taken into account, such as whether exposure of an adult or child was used as the basis (children consume less water per day but more in proportion to their body weight than do adults), or whether or not an additional uncertainty factor was applied to account for extrapolation from acute to subchronic or chronic effects. The toxicologist supported our core concerns noted below, however: use of a median-effect dose rather than a lowest no-effect or lowest-effect level as the starting point for the calculations; inappropriate use of a lethality study as the basis for setting a safe level for nonlethal effects; and – if such a study is to be relied on – application of too small an uncertainty factor in extrapolating from lethal to nonlethal effects. Standard risk assessment practice is far different: Such factors would normally be applied to a value called the “No Observable Adverse Effect Level,” or NOAEL. That is the dose at which no effect of a chemical exposure is observed. It doesn’t take a risk assessor to recognize that the dose at which no effect is seen is going to typically be far, far lower than the dose that outright kills half of the exposed subjects. In some cases, a NOAEL is not available, in which case a value called the “Lowest Observable Adverse Effect Level,” or LOAEL is used instead. That is the lowest dose at which an effect is seen in a study. While that dose is clearly going to be higher than the NOAEL, it will again likely be far lower than an LD50. Even so, substituting the LOAEL for the NOAEL will often be compensated for by applying an additional uncertainty factor. In the present case, then, officials have started with the wrong starting risk value, one that is far higher than they should have used. No doubt they did so because the values they should have used – the NOAEL or the LOAEL are not available for this chemical. But that’s no excuse for not compensating for this major problem, at the very least through application of an additional large uncertainty factor. This assumption can only have been pulled out of thin air. Put aside the convenience of selecting a factor that allowed a nice round number of 1 ppm to be set as the safe level. On what possible basis could it be assumed that the dose of the chemical that would, for example, be moderately toxic even in the short term to the liver or kidney, be only about one-eighth the dose that would kill someone outright in just 24 hours? Many health effects of chemicals occur at doses that are orders of magnitude lower than the lethal dose. So let’s step back and examine this 1 ppm level from another angle. The calculations would suggest that an adult who weighs 220 pounds (100 kilograms) would need to receive a dose of 100 milligrams of the chemical to suffer effects (that would be 100 milligrams per 100 kilograms of body weight, the same as 1 milligram per kilogram of body weight). To get that dose, an individual would have to consume 100 liters of water contaminated at the 1 ppm level (that’s because 1 ppm in water equals 1 milligram per liter). While 100 liters may sound like a lot, remember that officials are saying this is the safe level for ongoing consumption of the water. That level of consumption could be reached by drinking just 5 liters per day for 20 days. It also must be noted that exposure can occur not just through drinking water or using it to prepare food. Bathing or showering in such water would also add to the total exposure. Last and certainly not least, none of this math adequately accounts for the concern that long-term exposure to chemicals may cause chronic health effects, not just the acute (short-term) toxicity – in this case, lethality – that the Eastman rat oral toxicity study considered and on which all the calculations are based. Nor does the math account for how the chemical behaves in people – does it accumulate? Break down rapidly? Leave byproducts that are more or less toxic? Here again, the basic health data that could be used to answer such questions do not exist. Now, let me be clear. I am not saying that the level of 1 ppm is unsafe. I am saying that we have no way of knowing whether or not it is safe. The data needed to make that assessment simply do not exist for this chemical. 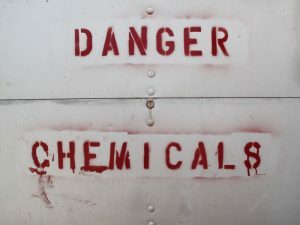 And that distressing reality is in no small part due to the failings of our nation’s chemical safety law, the Toxic Substances Control Act (TSCA) – which was the subject of my first blog post on this unfolding crisis. This entry was posted in Environment, Health Policy, Regulation and tagged Confidential Business Information (CBI), data requirements, exposure and hazard, general interest, WV chemical spill. Bookmark the permalink. Both comments and trackbacks are currently closed. The lowest NOEC is 25 mg/liter, or 25 ppm, for the minnows, which they supposedly survived in for 96 hours without effect. But the Lethal Concentration for the same minnows was barely twice that, just 57.4 mg/liter, which seems implausible. The daphnids NOEC was close, at 40mg/liter. Applying 100-1000x safety and uncertainty factors for humans, given that our skin is quite unlike that of minnows, it seems we should not be exposed to more than 0.25 or 0.025 ppm from bathing, hand washing, etc. Hope EDF or some other organization will file a lawsuit in Charleston tomorrow seeking an emergency injunction to stop this reckless exposure experiment on 300,000 people. I live in Kanawha City, we were zone 2 to start “flushing” our water, the flush is not working! We followed the instructions and repeated them for 3 hours…it is NOT WORKING! Water still has a very strong odor and is yellow. My 3 year old and I, 25 weeks pregnant, are starting to have symptoms if exposure. I’m in area 3 , my water has such a strong odor that I’m not going to use it to shower. I didn’t consider consuming the water however I have debated rather or not to jump in my shower since 8 am .. NO WAY AM I GETTING IN THIS WATER!!! Albert, this is kind of like Kirk’s other post. You don’t fully understand what you’re reading. Fish exposures are always a worst case for water contaminants. They’re not just exposed to it, they’re BREATHING it, and yes, for those kinds of experiments, a factor of of two and a half from NOEL to 50% lethal is not all that unusual. Levels that will kill a fish can be totally harmless in human drinking water. I don’t know if you’ve ever kept fish, but you know how you’re supposed to let tap water sit before putting a fish in it? That’s because totally harmless levels of chlorine that are in your drinking water are not at all totally harmless to a fish, and it takes time to dissipate. And here’s the thing, how many fish kills have been reported from this spill? Oh, somewhere around… none! The canaries are still chirping. And BTW, to Ivy- MCHM won’t make your water yellow. What you’re seeing is sediment from the flushing. Just keep flushing, it’ll go away eventually. That always comes out when they do a big system flush after a long time without one. It’s usually harmless, and it’ll go away. If it doesn’t, contact the water department. You probably will still smell some MCHM because it doesn’t become odorless until the concentration gets down to around 0.1 ppm, which is about a tenth of the safe drinking level. Stay calm, and keep using bottled water for drinking, if you’re worried. Actually your calculations in the article are way off. While you are correct that mg/kg is ppm, that refers to mg of drug ingested per kg of body weight. Roughly 1ppm is 1mg/liter, the LD50 you quote of 825mg/kg would be 825mg/kgx80kg(approximate avg body weight in US)=66,000mg, which would take 66,000 Liters of water ingested to achieve. Using the above assumptions lets do 3 10 fold reductions for ease which puts us to 66 Liters of water. Average water intake 1 liter in US, that would be 66 days to achieve the dose but remember that is not at 1 time so would likely require much more. Although there is no known safe level for this chemical 1ppm is overwhelmingly likely to be safe. I think anyone that feels differently is just stirring up trouble, especially given your elementary school interpretation of concentration and dosage. Senior scientist in your head maybe. Looking at other chemicals that are known to be safe at 1ppm I think it is easy to extrapolate this as a safe level. Consider this an official invitation to my home in south Charleston WV. I’ll offer you ice cold water and a nice hot shower. Afterwards a polite conversation regarding over reacting. These are not my calculations but those described by state health officials. I agree that dose per unit of body weight is not the same as concentration in water. The main points remain: It is not appropriate to draw conclusions about a safe level for avoiding nonlethal effects by using a study that only considered lethality. And it is not appropriate to apply adjustment factors to a median effect level rather than a no-effect or lowest-effect level. See the note I added to the post. All this could be cleared up if the methodology used and the underlying study were made public. Although the drinking water can be declared “safe” due to meeting federal standards, there may be additional unregulated chemicals in the water. If they are not regulated, they are not measured. Perhaps some new paradigms for reducing human exposures due to contaminants in drinking water are necessary – see the review article below for some ideas on how we can do that. Mr Donnay, I appreciate the valuable information you took the trouble to find and are now sharing. i would love to be able to post a twitter link to your comment here. Would that be acceptable? Actually that 2005 document was the first item available minus the attachment B & C they later added. Thought there was a disclaimer that was at the top that said something to the effect it was to be used for informational purposes only, although there is one at the bottom that has more text. Would like to see the original version to compare it this one URL 2014. I agree it’s incompletely known (as are the risks of everything), but it’s pretty unlikely to be hazardous based on the properties of similar substances. I would look at ethyl-1-hexanol and cyclohexanedimethanol as being close analogs, along with n-octanol, which is very well studied. The whole family of saturated medium chain primary alcohols is generally safe at those levels. It’s remotely possible that there’s an unusually hazardous metabolite, but the levels are only going to go down from here, so the chronic exposure argument is exaggerated. You’re not going to be drinking 1 ppm for years, you’re going to be drinking 1 ppm for a day, and then .5 ppm, and then 0.1 ppm and then undetectable levels. For bathing certainly, I think we can say with little doubt that there is absolutely no risk whatsoever at these levels. The primary metabolite is going to be a carboxylic acid, right? 4-methylcyclohexane carboxylic acid – it, or one of its isomers, is actually listed by the WHO as a flavoring additive in ester form, so it can’t be that bad. This is really a minor variation on chemicals that are very common in plant fragrances and oils. That ester is used in the soft drink Squirt and has been recommended it be removed as there is a health concern. Since you don’t give any more info, I have to guess that you’re talking about the benzoate. Hexahydrobenzoic acid and benzoic acid are not the same things. One’s an alicyclic, the other is an aromatic.The “hexahydro” synonym is an archaic naming convention in which cyclic aliphatic compounds were named as if they were hydrogenated aromatics, but it’s only used in legacy names these days since it’s not very apt. Their chemical properties are very different. And for that matter, benzoic acid is commonplace in natural foods (it’s part of a class that are referred to as phenolic acids – some health food outlets prmote them as antioxidants, which to be fair, they are). That’s one of those ones where the “scary chemical name” effect is particularly prominent. If benzoate/benzoic acid bothers you, you’d better stop eating fruits and vegetables because a lot of them are stuffed full of it. Blueberries, nice big dose of benzoic acid right there. Better ban those suckers. The reaction products of 1,4 cyclomethanedimethanol and HPAA in this (non peer reviewed) Januaruy 2011 communication to EPA’s Toxic Substances Control Act CBI (confidential business information) Center are reported to show anti-oestrogenic and anti-androgenic activity. If we assume the assertion that this close analog of MCHM predicts endocrine activity of the latter (and that the assayed breakdown products were free of HPAA), it appears MCHM should be regarded as having endocrine antagonist properties. Discussions in detail with Mr. Mady may prove most valuable. Typo:, 1,4 cyclo*hexane*dimethanol – as the commenter specified – is the molecule in the EPA study. I can’t reply to Kirk directly since the reply generator doesn’t seem to work so well, but he misunderstands the meaning of that paper he cited. Certainly, there are some “reaction products” of any substance that can be hazardous – that applies to water, nitrogen, etc. Cyanide – that’s a potential reaction product of carbon and nitrogen, for example. If you react a chemical with another chemical, it’s obviously not the the same chemical anymore. You would have a point if the reactions you’re talking about were likely to occur in nature with a high yield, but they’re not. Those are processes are run in chemical plants using cyclohexanedimethanol as a precursor, basically a raw material that’s used to produce other chemicals. The reactions we need to be concerned about here are metabolic reactions, what happens to the chemical when it’s absorbed by an organism, and the main metabolic process for alcohols is oxidation, either to a ketone/aldehyde or to a carboxylic acid. Alcohols are basically food (sugars are actually a sort of highly compact alcohol), and most organisms are capable of metabolizing a wide range of alcohols, so the biochemistry of alcohol metabolism is pretty well studied and understood. Were the assertion about reaction products as a non specific cause of toxicity valid, this would be most consistent with results in which each set of reaction products generated the same pattern of toxicity. After all, the substrates for all the reactions are hydrocarbons/carbohydrates (if i am reading correctly). The experimental results in the communication to EPA clearly show dissimilar patterns of toxicity. This demolishes the assertion that reaction products are the non specific cause of toxicity. The fact that different sets of reaction products – all from hydrocarbons and or/carbohydrates – generate dissimilar patterns of endocrine toxicity also demolishes the assertion that the cited study is merely describing alcohol metabolism. I do appreciate the opportunity for the EPA document to have stimulated the generation of multiple hypotheses, irrespective of their lack of face validity. I do observe that the American Chemical Society has embarked upon very successful marketing campaign and that a core aspect of the campaign is to falsely claim those raising concerns about chemical toxicity lack comprehension of cited data. This has been going on in one form or another well before Rachel Carson published Silent Spring. Deevra Davis’s The Secret History of the War on Cancer<i. exhaustively documents nearly a century of these efforts. Doubt Is Our Business focuses more specifically on how such techniques were extensively developed by tobacco, and then picked up by petrochemical companies. No accident that many of tobacco’s PR minions now work for fracking and petrochemical groups. I have also observed – especially in Bay Area tech start up culture, but also in chemistry faculties, a diffusion of the ACS’ very successful campaign. This appears to be proceeding along patterns of cultural identification analogous to those by which petrochemical megacorps and their PR servants have elevated denial of the fact of carbon dioxide and hydrocarbons’ effects upon atmospheric chemistry and physics into cultural signifiers. The same PR machine was turned upon Theo Colborn and colleagues when they identified and robustly researched the very real fact of endocrine disruption in Our Stolen Future as well as upon Sandra Steingraber from the time she published her first book, Living Downstream. These century old PR techniques are tiresome, but predictable – and repeatedly lacking in validity. The tactical objective is obfuscation: the strategic objective – as it was with vinyl chloride, lead, and tobacco – is to delay public comprehension as long as possible. There’s great wealth to be made by insulating profitable toxins from effective public action. As a physician the idea of being “pro” or “anti” chemistry is fatuous. Some molecules harm; others help. Those with intellectual integrity who wish to learn about endocrine disruption will find a wealth of information and peer reviewed published studies cited at The Endocrine Disruption Exchange (endocrinedisruption.org) . I regret that at this time I do not have a link for resources which may be of assistance to those who seek assistance in acquiring the capacity to comprehend experimental findings in transgenic yeast systems incorporating human hormone receptors. Mea culpa. Melody – self employed at a tech startup in California. Kirk – the reactions in question are esterifications with HPPA, hydroxyphenoxypropionic acid (say that three times fast). HPPA is a phenolic compound so one would presume that most of its hormone-mimetic activity is from the phenol in the HPPA, since phenols are particularly prone to such things, like, you know Bisphenol A. CHDM is not in any way phenolic – it’s not even aromatic (in the chemical sense). What you’re doing it taking data for CHDM+HPPA and saying that predicts what CHDM does, and that’s not really how it works. At 4:47 pm we are told the observed endocrine disruptor activity from CHDM reactions should be asrcibed to generic and unspecified “‘reaction products’ of any substance that can be hazardous'”. At 9:58 pm we are told from the same source that observed endocrine disruptor activity is due to a very specific esterification process with a specific reagent. At 3:03 AM I specifically addressed the prospect that observed endocrine disruptor activity from HPAA among the reaction products must specifically excluded. Oddly enough, that mechanism didn’t seem to merit at 4:47 PM, but assumed central importance five hours later. This continually moving causal explanation is highly consistent with the goal of denying possible toxicity – and intellectually incoherent. The data set has not changed in those five hours: the rationale for dismissal of potential endocrine disruptor activity has jumped around a fair bit. Qui bono? The cited report clearly indicates that HPAA was independently assayed for ED activity, and as expected demonstrated to exhibit same. Now we are being asked to believe the author of the report and his corporation chose to spend the time and money to report to to the EPA that a known estrogen disruptor causes ED both solo and when chemically bonded to a substrate: and that these results demonstrate validity of the test model. And we are being asked to believe that what we are told will inevitably cause ED effects was not regarded as a reference substance by the company. Were this to be the case, perhaps the appropriate warning would the to the reporting company’s investors and/or stockholders: someone’s burning through their assets for no reason. 1) The close MCHM analog CDHM merits comparison for biological activity. 2) Oops! The report showing biological ED activity in CDHM breakdown products is misunderstood: “there are some “reaction products” of any substance that can be hazardous”. 3) Um, er … OK – so the “reaction products” of multiple different molecules with the same set of atomic constituents show differential ED activities…..it’s um – because the paper auth and his company chose to duplicate assays of a reference ED’s activity. And this mechanism didn’t merit mention five hours ago. Because science! Pro Tip: start ups seeking investor financing generally wish to avoid complete incoherence in their public interactions. Like, say, this one. As stated at 3:03 AM, as the cited paper does not discuss whether CDHM breakdown products assayed for ED activity also contain the reference reagent known to possess ED activity. On the off chance the cited paper is from people who don’t know how to measure one variable at a time, clarification of presence/absence of the reference reagent in the CDHM breakdown products would at least provide additional information. And if the start up doesn’t pan out, fracking is hiring good obfuscators! As for me….um…three rounds of replying to mutually exclusive assertions whose sole common feature is their conclusion: the chemical in question can’t possibly have a potential risk – is enough time from my life spent on this set of rhetorical tricks. The ACS’ play book is quite shopworn: I’ve been beating it like a drum for fifteen years. Have fun, folks! Kirk, I would reply to that if it made any sense. I’m guessing you didn’t major in chemistry in college then? The message from this spill should be cautionary, not alarmist. In all probability there are additives in the soap that you wash with that are more toxic than the water you are bathing in. The exposure to the denaturant in the alcohol in your mouthwash is much more toxic than the water. Do we need to protect our water sources better? Hell yes. The less than 2PPM impurities in the Elk and Kanawha that have been ingested for years due to coal mine runoff and years of chemical plants make swimming in those rivers, much less drinking them, a matter of concern. We need to better protect our water sources. We need to better contain our toxic chemical storage. But we did not need to shut down the water supply for all those people based on the amounts present in that spill. A do not drink advisory would have been sufficient. You my friend (James Lynch) are NOT the one using the water. Did you see the comment above about the woman and child in Kanawha City? Do you think they are lying? Or do you think the stink coming out of the water lines is just a farce? I agree that there are chemicals we are ingesting in our foods and supplies but this is an total act of negligence on behalf of Freedom Works and WV AMERICAN (German) Water Co. Yet our officials still vote for increases in the rates! Who really knows what the impact will be for future generations? Guess we are the “test case” and will find out as they will be putting our species under a microscope for the next 20+ years as a science project. I misspoke of whom I was replying to…..it was JAMES FILES not Mr. Lynch…..sorry about that! No, Mr. Files is correct. Very similar kinds of alcohols are routinely used in scents. I would agree that there’s no point in taking a chance on drinking water with over 1 ppm concentrations if you can avoid it easily, but even at the maximum concentration I saw reported, which was about 3 ppm, nobody was ever in any real danger from it. It’s better to be safe than sorry, but in this case people got lucky and it turned out to be a relatively harmless, albeit strong-smelling, chemical. I’m no scientist, but the one accusation here that is surely erroneous is that there may be harm from “ongoing” consumption (though the claim that it is safe to do so could be wrong). The product is a soluble organic and they already have consistent readings of 0 at the intake. Few people drink 5 liters per day and it’s nearly certain the readings will be 0 throughout the system long before 20 days. It’s also a safe bet that while most people may shower and wash their clothes after the flush, few will be consuming the water for quite a while. I know I won’t. Isn’t that an argument for telling people they still shouldn’t drink the water, but can now wash dishes/clothes and/or shower? I clearly struggle with remedial html. I f anyone at EDF can close the open italics tag after “Secret History of the WAr on Cancer, I’d be most grateful. Correcting my misspelling of Devra Davis’ name (and rescuing it from italics with the tags I omitted) would also be very much appreciated. This spill made me sick – twice! Not from drinking it – unless that cocktail was in the water BEFORE it was reported. It was from fumes in the air as far as I know. The 1st time I was coughing until I nearly blacked out. I was diagnosed and treated for bronchitis. We hadn’t used the water for anything but an occasional toilet flush for an entire week. I live in Cincinnati where the Ohio River flows and I am dismayed that the chemical spill in W. Virginia. ever happened and I am very concerned for the health and safety of the people there. What caused the spill? There are no guarantees that this will not happen again. Where is our protection? Has anyone ever considered the creatures that live in our rivers and creeks which is their HOME, the fish, the frogs, the turtles, the salamanders and crawdads, etc. Those that live in these waters and those who drink from these waters, animals and humans alike are slowly being poisoned by chemicals and pollution. We can no longer swim in the Ohio River. Where is our protection? Instead of those in power describing these catastrophes in detail, they should take action and have the concern and common sense to make sure that they protect us and our environment, the latest threat being the catastrophic chemical spill in W. Va.. Where is the EPA, Environmental PROTECTION Agency? I have no understanding of programming however I had been hoping to start my own blog soon. officials trust shaky science in rush to restore water service: One-part-per-million “safe” threshold has questionable basis.